Dubai’s Sheikh Mohammed bin Rashid Al Maktoum opened the world’s tallest tower today and renamed it after the ruler of neighboring Abu Dhabi, which bailed out Dubai during the country’s debt crisis last year. The 200-story Burj Khalifa cost $1.5 billion to build, said Mohammed Alabbar, chairman of developer Emaar Properties PJSC. The tower takes it name from Sheikh Khalifa Bin Zayed Al Nahyan, who is also president of the United Arab Emirates. While mainly residential, the building will have 37 floors of office and retail space. During the five years of the tower’s construction the sheikhdom’s debt-fueled property market went from the world’s best performing to the worst, forcing officials to renegotiate loans and seek bailouts from Abu Dhabi. The Burj’s occupancy rate may reach 75 percent this year, with office leasing proving the biggest challenge for investors, said Roy Cherry, an analyst at investment bank Shuaa Capital PSC. “Those who bought with the intention of leasing will face a difficult time because few companies today can justify paying premiums for luxury,” Cherry said. 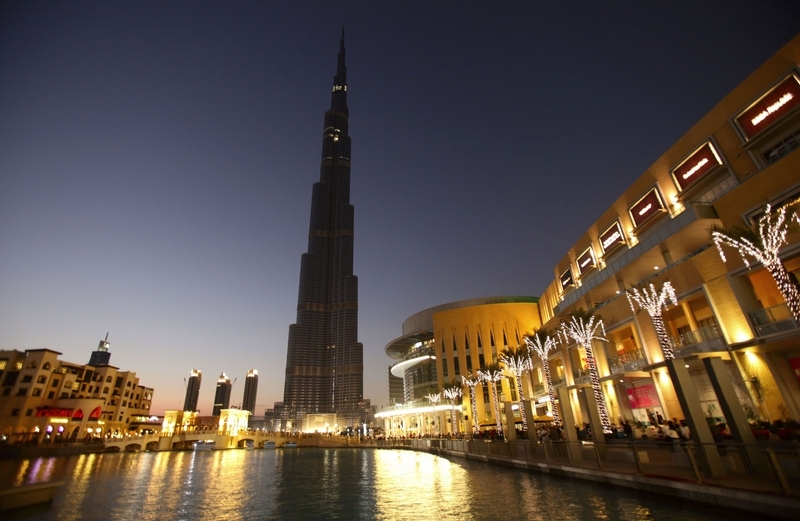 Burj Khalifa has a height of 828 meters (2,717 feet), Alabbar said in a telephone interview today. Apartment prices in the tower, formerly known as Burj Dubai, have fallen to less than half of the 10,000 dirhams ($2,700) a square foot that they reached at the 2008 peak. Dubai real-estate prices have fallen by 52 percent since the market’s peak as owners struggle to cope with thousands of empty properties started before the global credit crisis stifled investment. Even after developers canceled billions of dollars worth of projects, enough new buildings will come onto the market this year to push down prices further. The Dubai tower “is the most expensive square footage in the region and I’m not sure in the current downturn that will translate into strong residential or commercial demand, despite the prestige factor,” Masud said. The residential part of the building will have fitness facilities, a library, a cigar club, valet parking and a gourmet market, according to the tower’s Web site. The goal is an “unparalleled lifestyle experience,” the site says. The building has some of the highest maintenance fees in Dubai at 80 dirhams to 90 dirhams per square foot annually, according to Dubai property broker Better Homes. Fees in the surrounding area average about 18 to 20 dirhams. “This is a building with many unique components which could cost a lot more than usual to maintain or replace,” Shuaa’s Cherry said. Designed by Chicago-based Skidmore, Owings and Merrill LLP, the structure overtook Taipei 101 as the world’s tallest in February. Emaar delayed completion of the project by more than a year because the interior had to be redesigned. The tower has 200 floors, more than 160 of which will be occupied, Alabbar told reporters at a press conference in the building today. Emaar is celebrating today’s opening with light, water and firework displays. Thousands of tourists and residents gathered in the area surrounding the Burj, which links to Dubai Mall and the world’s biggest fountain, hours before the event started at 8 p.m. local time. Roads leading up to the tower were clogged, forcing residents of the Downtown development to leave work early in order to get home. Sultan al-Falasi, a 35-year-old businessman from Dubai, reserved a suite in the Address Hotel facing the Burj and invited friends to watch the fireworks. The centerpiece of the $20 billion Downtown Dubai project includes 37 office floors, 1,044 apartments and 160 hotel rooms designed by Giorgio Armani. It also has the world’s highest mosque and swimming pools on the 158th and 76th floors. Emaar said it expects 12,000 people to live or work in the tower and connected office buildings. Burj Khalifa is located halfway between the city’s older districts of Deira and Bur Dubai and newly developed communities in the Marina and Emirates Hills. Emaar aimed to make the Downtown area the city’s new center, benefiting from the development’s proximity to the Dubai International Financial Center. The DIFC, as it’s known, is a tax-free business park that houses hundreds of companies. An observation deck on the 124th floor of the empty Burj building will open tomorrow, while the first Armani Residences will be handed over next month, followed by the Armani Hotel a month later. The first residents won’t move in until February. Emaar will start handing keys to the buyers of another 900 apartments and offices in March, it said in a statement. Emaar sold 90 percent of the properties in the tower prior to its completion and years before the global financial crisis caused banks to curtail mortgage lending, Alabbar said today. Emaar achieved a return of 10 percent on its investment. The Tall Tower, as the Burj is known locally, was started in 2004, two years after Dubai first allowed foreigners to own property. The law sparked a six-year boom fueled by speculators. For investors like Dilip Daswani, who bought directly from Emaar, the tower still represents a good investment. The 45- year-old Briton paid Emaar 2,563 dirhams a square foot. He earned a 40 percent profit on one property sold two years after the purchase. The two-bedroom apartment he still owns cost about $1.2 million in 2004 and Daswani is now asking for $1.9 million. Less lucky investors bought apartments for as much as 10,000 dirhams a square foot at the peak. Brokers surveyed by Bloomberg estimated the current price at about 4,100 dirhams. Emaar, 30 percent owned by the government, reported a third-quarter profit that beat analysts’ estimates after it completed sales on high margin homes ahead of schedule. By contrast Dubai World, the parent company of rival developer Nakheel PSJC, is seeking to alter terms on about $26 billion of debt. Dubai World repaid $4.1 billion on an Islamic bond from Nakheel last month after Dubai received a $10 billion loan from the Abu Dhabi government. The tower is surrounded by a man-made lake, where the world’s tallest fountains gush every night to the sound of opera, Arabian and Indian music. The complex includes a shopping mall and several hotels. Many buyers in the residential part of the tower are wealthy individuals from the Middle East, India and Pakistan who bought apartments as vacation homes or as an investment, said Jesse Downs, director of research and advisory services at Dubai-based Landmark Advisory.